Focus on the needs of your readers. This can be effectively accomplished by leading with the problems your solution overcomes, rather than the actual solution itself. This might seem counterintuitive, but it really is just the opposite. By focusing on the pain points experienced by the reader and talking about the problems caused by those pains, you are establishing credibility with the reader and simultaneously filtering out unqualified customers. You know every tax dollar counts: The post-recession drop in funding coupled with mounting financial commitments and legislative demands for improved access to information leave no choice but to make operations more efficient. 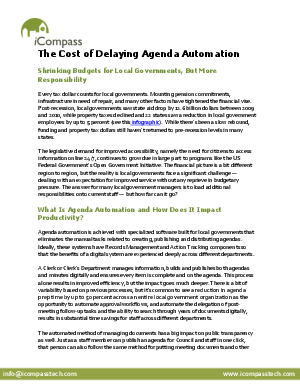 Agenda automation—software that eliminates the manual tasks of creating, distributing, and publishing agendas—significantly reduces the prep time and associated costs of meetings while introducing a flexibility that makes tight deadlines easier to manage. It not only pays for itself in paper savings, it brings money back into the budget—from $300 to $1000 per meeting, depending on the size of the organization. City of Issaquah, Washington – population 30,000: Prep time reduced by 50 percent, saving $500 per meeting in paper costs and reduced staff time. City of Fort Dodge, Iowa – population 25,000: Reduced the amount of time staff spent on manual agenda, meeting, and records management tasks and increased transparency by giving citizens online access to archived information. City of Plant City, Florida – population 34,000: Clerks spend 10 fewer hours per meeting working on agenda preparation. Town of Whitby, Ontario – population 122,000: Estimated savings of $500,000 over 5 years in paper and staff time expenses. It’s very rare that you can spend money to save money in local government. And the impact is far reaching, from improved transparency to freeing up staff time to work on other initiatives. Learn more about how easy it can be to automate your meeting agendas, and what you can get back as a result.